I have no idea why the phrase I’m using as a post title, “Tentacular and the Octophants”, jumped into my head this morning, but it did. Likely culprit: a cool print of an Octophant that’s now become a t-shirt. This might make a good birthday purchase. I’m just sayin’. I also think the title would be a great band name. Very 70’s prog rock or terrible high school/college rock noise experiment. It’s a definite contender for inclusion in my upcoming novel for NaNoWriMo. You remember NaNoWriMo, right? The annual novel-writing competition that takes place each November. I’ve participated three times now with almost an entire 50,000 word novel as the result, spread across 3 years and 3 topics. It’s been more of a lark in the past, but it’s put up or shut up time in 2008. 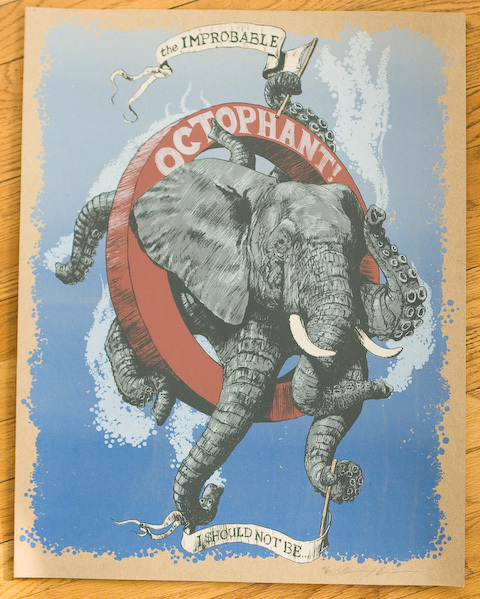 So I’ve got this little nugget – a band name – Tentacular and the Octophants. And I’ve got a phrase I’d like to use, maybe as the novel’s title: “Land O Goshen”, which my paternal grandmother still says. My cousins grew up in Goshen, Indiana and I think some kind of coming of age/finding yourself/switching identities story would work well there. Or maybe referencing that mundane locale with the biblical Goshen. Anyhow, I’ve still got another 3 weeks to plan the structure, jot down some more snippets of dialogue and clever phrases and study up on Egypt, Indiana and the concept of identity (both personally and online). I always wished NaNoWriMo took place during the summer instead of during the school months. I just don’t have the time to write a novel and get passing grades. Best of luck to you though.